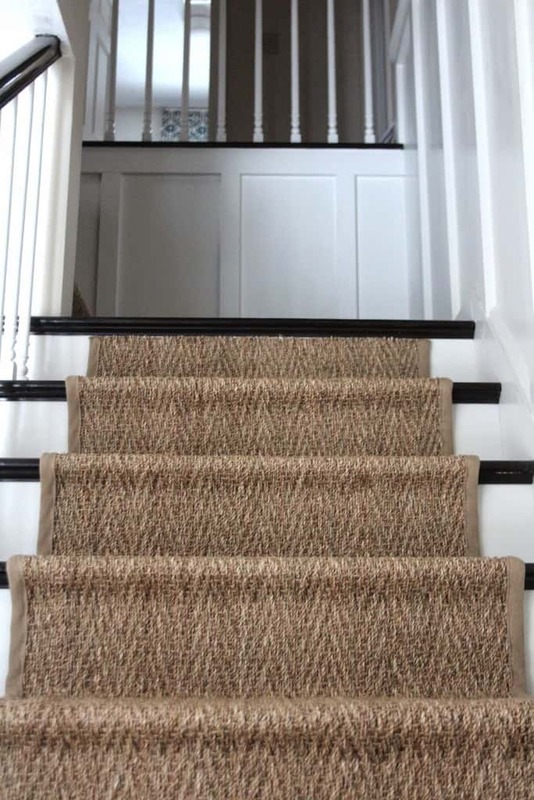 I get emails all the time from readers about the seagrass stair runner I installed a year and a half ago. I thought it was high time I share a Q&A, after my very active family of five has had a chance to put it to the test. 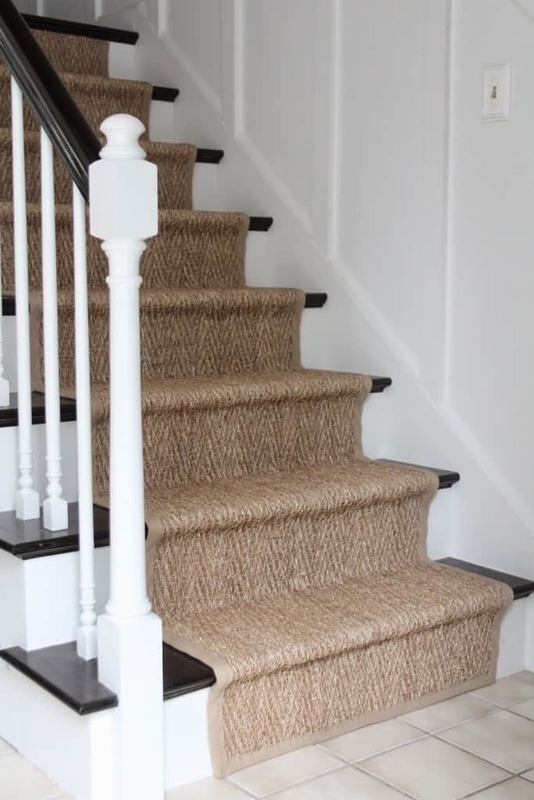 The one downside to using a natural fiber rug is that it is hard on bare feet, which my kids are not fond of, but I am willing to sacrifice comfort because I need something that can take a lot of abuse on the stairs. Before I installed the runner I spent three years doing my research on whether a natural fiber runner would be a good choice for stairs that get a lot of traffic, in a home that has 1) teen & tweenagers who run up and down the stairs a million times a day when they are home, and 2) a very furry dog, who doesn’t go upstairs but whose fur manages to travel to every corner of our home. After mulling it over, I finally took the plunge, and I’m so happy I did!! This is our experience after living with this herringbone pattern, cotton-bound seagrass rug for 17 months and counting, based on questions I’ve received from readers. One sisal rug company recommends NOT using natural fiber on stairs because they pose a risk: “The surface of the plant fibers is smooth enough that people wearing leather-soled shoes could slip and fall.” I was curious about this statement because my family knows from experience that uncovered hardwood stairs and stairs with a wool runner can be hazardous, since various members have slipped on both over the years. Aren’t ALL stairs inherently hazardous? 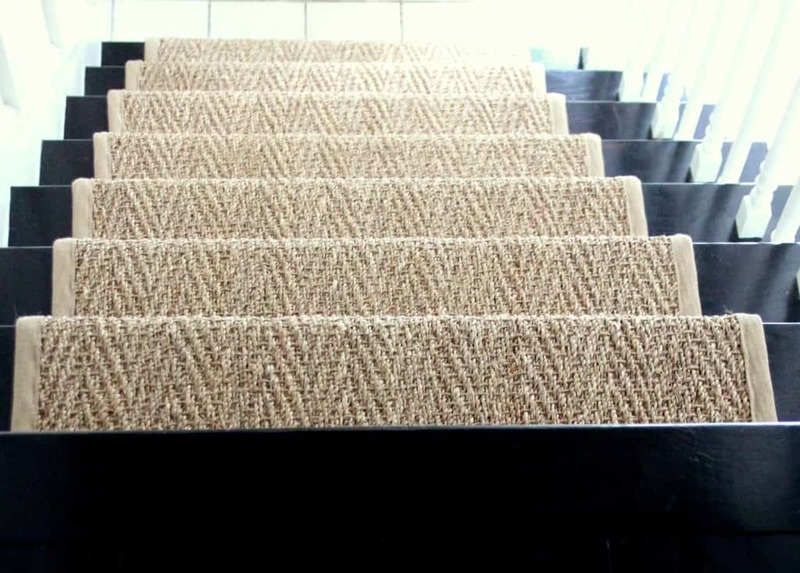 Would a natural fiber rug make stairs even MORE so? In our experience, NO. 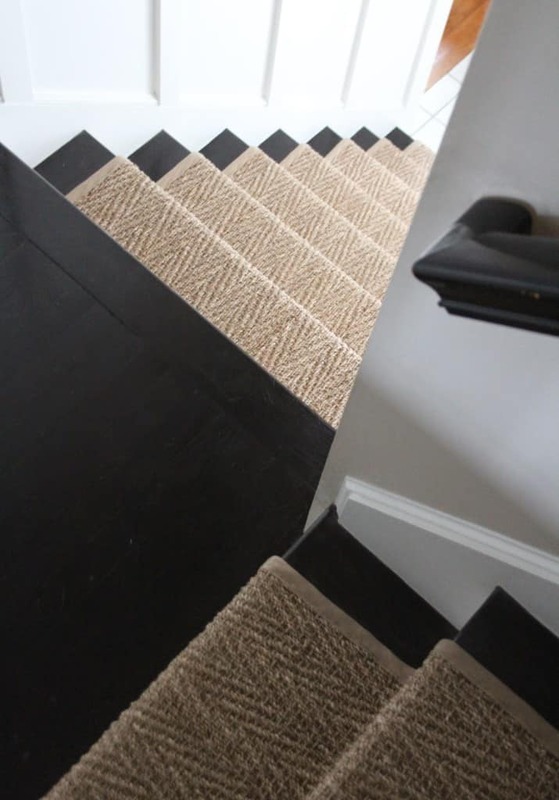 The slippery factor might be a bigger issue with sisal, or a jute or seagrass with a smaller and tighter weave, but the herringbone pattern has a lot of texture. Basket weave seagrass also would be a great option. YES! 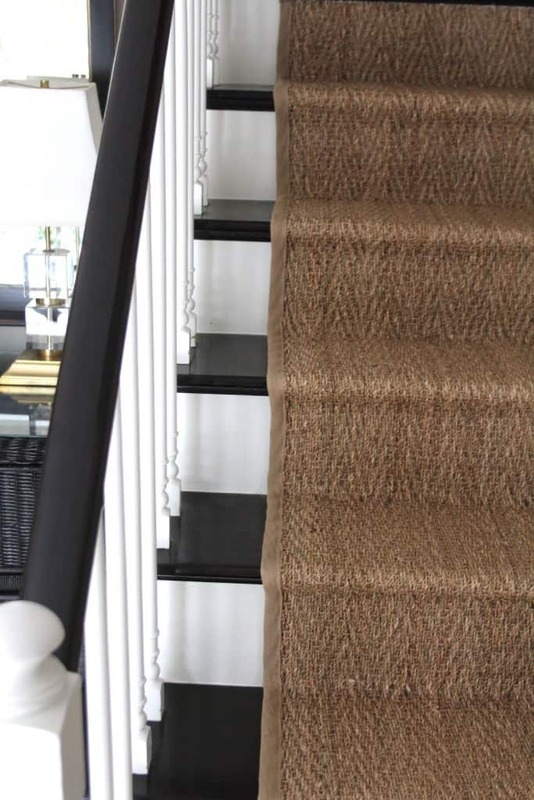 We have found the seagrass runner to be extremely durable on stairs. It doesn’t show dirt or the dog’s fur from our socks unless you inspect it closely. I vacuum daily thanks to our furry family member, and the seagrass weave is loose enough that anything on it comes right up. 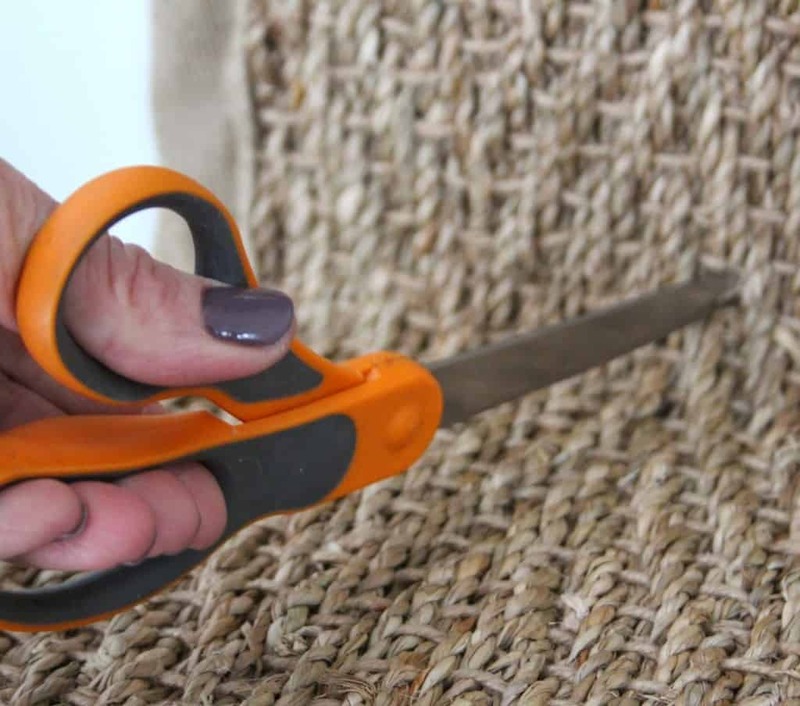 In my experience with natural fiber area rugs in other parts of our home, if food or something solid (like play-do for instance) is on the rug, it’s best to let it dry, and then scrape it up and vacuum out the bits that are left. Stay tuned for some tips on cleaning natural fiber rugs in the near future. When the runner was installed, a bunch of the fibers popped out within the first few months. Since then the amount of loose fibers has decreased substantially despite constant traffic and vacuuming. I cut minor loose fibers with scissors. One long strand did come loose and I used a bit of wood glue to press it back into the weave of the runner. Otherwise there have been no issues with loose loops. I imagine if you have a pet who uses the stairs this might be more of an issue. DOES THE COTTON BORDER GET DIRTY? No one ever seems to step on the sides of the runner and so the natural colored border looks like it did the day it was installed. 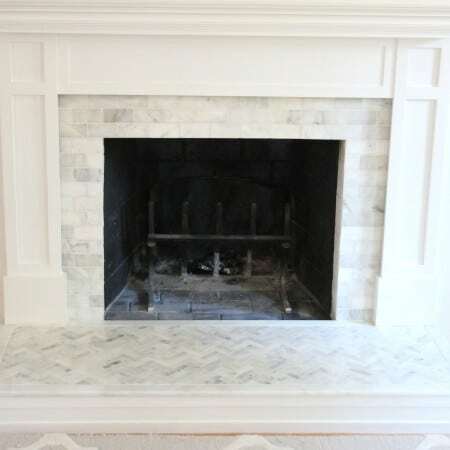 However, beware that light colored borders can get very dirty and are not so easy to clean, so take that into consideration if you are purchasing a natural fiber rug with a border. 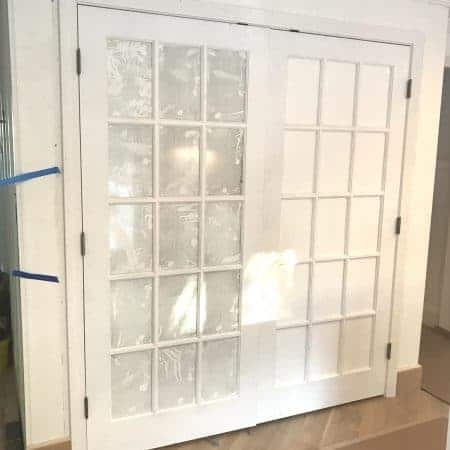 I have one in my mudroom and the tan border is really beat up, although the seagrass isn’t show much wear or staining. CAN YOU SEE THE STAPLES? Seagrass is a thick fiber, and both herringbone and basket weave patterns are quite dimensional, so it’s easy to hide staples. The first few steps that I installed have a few visible staples, but they blend pretty well – you would have to look to find them. 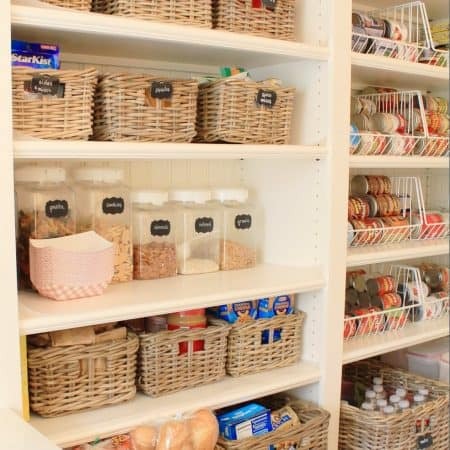 A stair rod would hide these perfectly (they’re on my 2015 to-do list!) I stapled alongside the fibers instead of across them to hide the staples as much as possible. This was the first runner I ever installed myself and so there was a bit of a learning curve. I worked my way up from the bottom, and the first couple of steps are a little looser than the rest. Also – stop and stand back frequently to make sure your runner is still centered. Even though I used painter’s tape as a guide on either side, it was easy to get a little bit off as you worked on stapling. A second set of eyes and hands is helpful, but you CAN do it yourself! 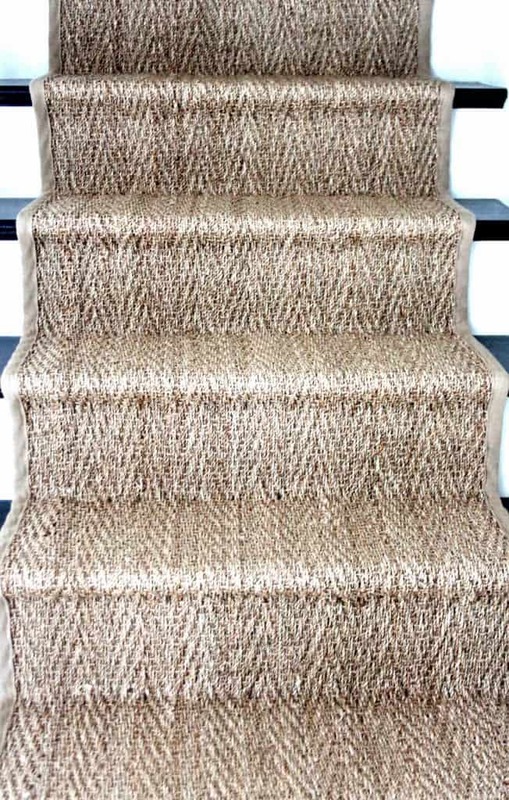 YES – in a heartbeat I would install a natural fiber rug as a stair runner again!! 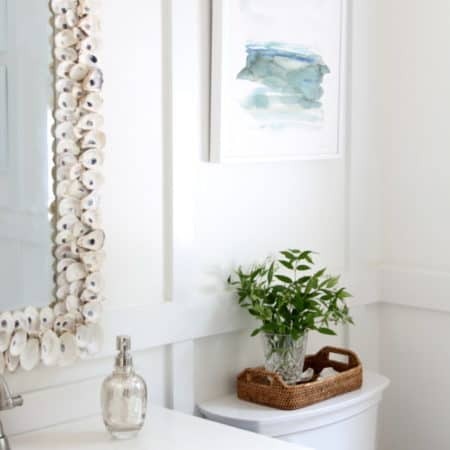 I love the way the seagrass changed our house – it definitely brought a fresh feel to an 80s era traditional colonial. I must admit, installing this runner on our stairs was a bit intimidating at first, but after doing it I can honestly tell you that it wasn’t difficult! For the step-by-step tutorial check out this post, and for tons of stair inspiration photos check out my Pinterest board on fun staircase ideas. This post is purely based on my opinion and is for informational use only. Please exercise caution with any DIY project and in using stairs! 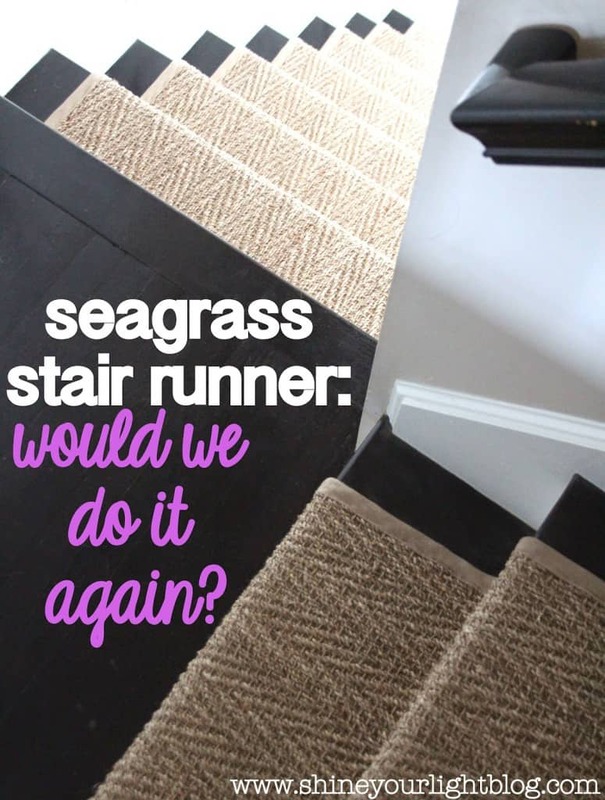 The original seagrass stair runner tutorial is one of my most highly viewed posts and I get a lot of questions about it. For more tips on what kind of runners to avoid, issues to be aware of and tons of affordable runners I recommend for this project, visit this post. If you have any other questions send me an email and I’d be happy to try and help! This is great to know as I've been researching this very thing. Thanks for sharing! I love this and am glad to hear you'd do it again! 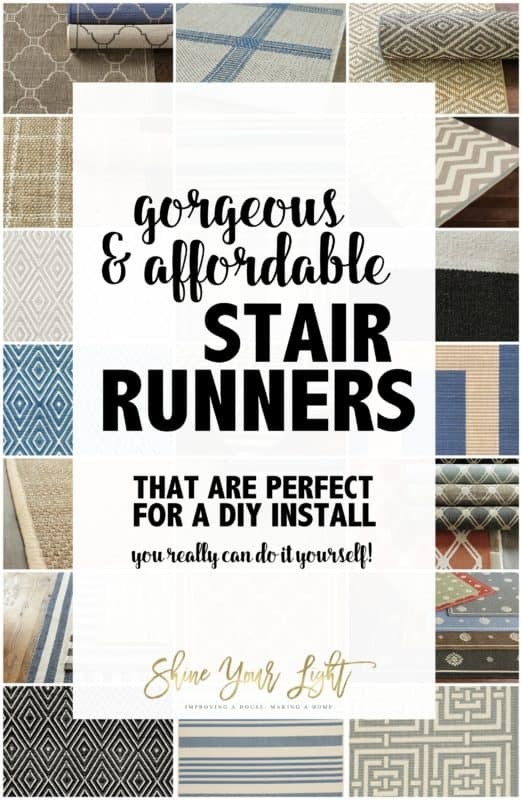 Your stair runner looks great. Do high heels catch in it? Thanks for that wonderful update Lisa, I might go natural when the time comes for me to replace our runners! I am so happy to see this post. I have been mulling over the idea of a runner for years. I love this one in particular too so i just pinned it for when I am ready to bite the bullet! Is there anything you can't do? It looks amazing. One day I want a stair runner of my very own. This will be great info to refer to. Thanks Lisa! It's so beautiful Lisa. Glad to hear you are happy with it! Good to know and I love the look so much! Glad its held up! And it looks so good still. Great project!